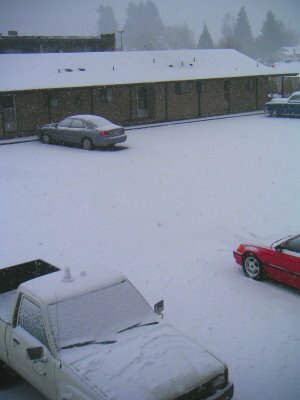 This is the view from my apartment right now. I went out side in bare feet and wet hair to take a picture for you all! Good thing my apartment is so warm 🙂 It’s snowing even fatter snow flakes now. So beautiful. This is the time for warm comfort food, and I’ll have some of that coming, but right now here’s the next installment in my “What to bring to a Party” series. 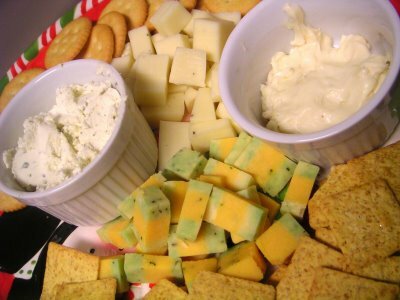 One of the simplest and fastest party foods to put together is a cheese tray, and everyone loves it! These cheeses were left over from Eric’s and my amazing Christmas date we had on Saturday. We probably ate half in Leavenworth and brought the rest back home to bring to our Bible Study party on Tuesday. I’m giving you a close up of our favorite recent cheese discovery. English 5 Layer Cheese. Double Gloucester with. Spring Onion &. Sage Derby from Trader Joe’s. It’s only two or three layers once I cubed it, but it is completely worth its incredibly long name. I’m going to have to go back for more. This is what the Trader Joe’s newsletter says about it. Spring Onion and two layers of Sage Derby. cheese are cut and stacked. flavor, which complements the spring onions. and Shiraz (it is the holidays after all). 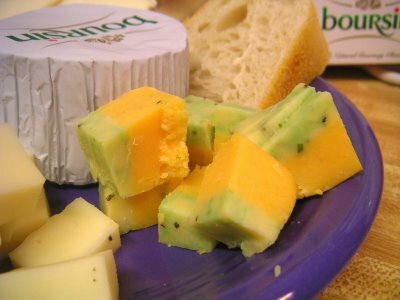 Sage Derby Cheese for $11.99 per pound. The white cubed cheese is Italian Black Truffle cheese, it was pretty good, but I preferred the richness of the 5 layer, and the truffle cheese didn’t have enough truffle for it to stand out. Very mild. We also had Boursin on the left, and Brie on the right. I love a cheese plate with options for dipping/spreading, as well as chunky finger food pieces. Add some crackers and a loaf of bread and you’ve got a complete party treat. Oh my that looks so divine! I love cheeses, the black truffle cheese sounds really nice! I think I could have a cheese addiction! I seem to want some kind of cheese all the time. It was sooooo good. Gotta get that cheese next time I am at Joe’s! I didn’t like the truffle as much as the layered one either. Of course Boursin is divine all the time, my fridge is never without it!